An mcsv file extension is related to the TouchGraph Navigator and used for its MCSV data files. What is mcsv file? How to open mcsv files? The mcsv file extension is associated with the TouchGraph Navigator a tool for graph visualization and social network analysis software for Java platform. The mcsv file stores data in multiple comma separated value file format. MCSV is similar to CSV format, but it is used to embed more tables to one file. 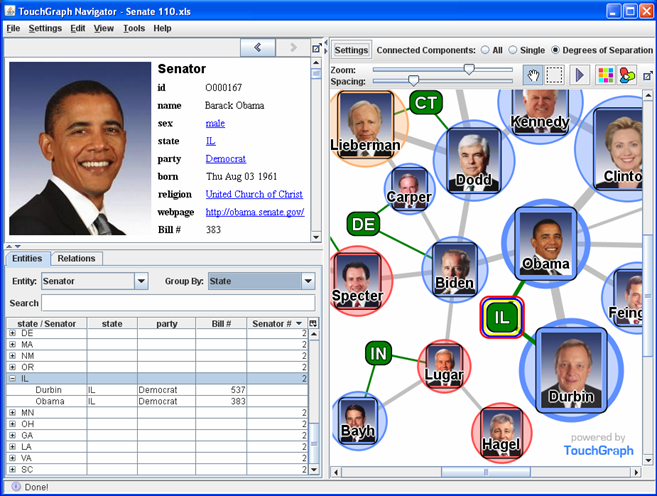 TouchGraph allows users to create and navigate of interactive graphs. Ideal for organizing links, or mind mapping. Use TouchGraph Navigator to open *.mcsv files. Probably cannot be converted to other formats. and possible program actions that can be done with the file: like open mcsv file, edit mcsv file, convert mcsv file, view mcsv file, play mcsv file etc. (if exist software for corresponding action in File-Extensions.org's database). Click on the tab below to simply browse between the application actions, to quickly get a list of recommended software, which is able to perform the specified software action, such as opening, editing or converting mcsv files. Programs supporting the exension mcsv on the main platforms Windows, Mac, Linux or mobile. Click on the link to get more information about TouchGraph Navigator for open mcsv file action. Programs supporting the exension mcsv on the main platforms Windows, Mac, Linux or mobile. Click on the link to get more information about TouchGraph Navigator for edit mcsv file action. Programs supporting the exension mcsv on the main platforms Windows, Mac, Linux or mobile. Click on the link to get more information about TouchGraph Navigator for create mcsv file action.